Now that you have been introduced to the basics of valve stem protrusion specification and how they pertain to Panheads and Shovelheads, let's go back to the beginning, so to speak, and look at what most would concede to be Harley's first modern OHV engine, the Knucklehead. Time to "fess up." 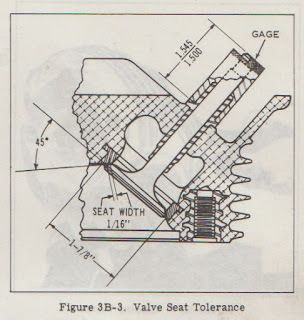 The question of the valve stem protrusion specification for a Knucklehead is one I have never been able to come up with a definitive answer to, and I have been pondering it for about 30 years. Apparently the factory did not feel it was important enough to publish (at least anywhere I have been able to find) or just overlooked it. One of the figures I've seen offered (it was on the Internet, so it must be true!) is that the factory spec was 1.575-1.580" measuring from the shoulder on the guide to the tip of the valve. While this may be correct, no source was cited. Did it come from a factory drawing or was it info passed on from someone's step-uncle who once heard it from a guy who knew someone who worked on Harleys a lot under a shade tree in the back yard to supplement the income from his day job changing tires and doing oil changes at the local Texaco station? Either way, this spec, to be accurate, would need to take into account the differences in the thickness between stock and reproduction gaskets that go under the lower spring cup. I cannot be sure what the OEM gasket thickness was, but from supplier to supplier I have seen as much as .030" difference in the thickness. Then if you use 2 gaskets under the intakes as the manual calls for, you have doubled any error. Incidentally, if the factory was able to hold a .005" tolerance on valve stem protrusion in the '30s and '40s, they were doing far better than what is seen from them today (admittedly a very real possibility). Another of the "specs" I have seen given (also on the Internet, so it also must be true!) for Knuck stem protrusion is 15/16" above the top of the valve guide for the exhaust and 7/8" for the intake. Even if a source for that info was given, it would be meaningless without the dimensions of the OEM guide top. The guides available today are not even the same shape as the originals above the flange, let alone the same height. True as it may have been at one time, it is about as useful as giving directions to a stranger that include the phrase "turn left where farmer Smith's big red barn used to be." One other "spec" I have seen published in a recent book, also without a source quoted, is intake 1.525" minimum/1.570" maximum and exhaust 1.575" minimum/1.620" maximum. That would also suffer from being at the mercy of gasket thickness. I also tend to think that any stem protrusion "spec" that is given with intake and exhaust being different one from the other is probably suspect, because that would mean that without shimming, the spring installed height and seat pressure would be different intake to exhaust. I am quite sure valve spring shims were not factory installed. My guess is that those "specs" were extrapolated due to the difference in overall valve length on Knuckles, intake verses exhaust. Either that, or valve seat pressure difference intake to exhaust was considered acceptable by the factory. The difference of .050" of installed height would work out to about 16 pounds more seat pressure on the intakes if KPMI's stock replacement springs are indeed made to exact OEM spec as advertised. That is probably within the realm of possibility also, but again I would like to see a source. There is a chart on page 82 of the Panhead Service Manual 1948-1957 Rigid that lists specs for 18204-36 inner and 18203-36 outer OHV springs. Those would be the stock springs for a Knucklehead. The chart lists a compressed length of 1.40625" for the outer spring under a column labeled "valve closed" along with a "valve open" length of 1.0625". That leads me to believe that the 1.406 figure would be within the acceptable range for spring installed height. Adding the lift of a stock cam, which the same manual lists as .343" for a Knuckle on page 89, to the open height of 1.0625" gives 1.4055" which matches the 1.40625" after allowing for rounding up or down. Now, the question becomes, does this spring installed height reflect a minimum or maximum valve stem protrusion, or is it somewhere in the middle? Back to that table of specs. According to it, the "Knuck" springs (we'll call them -36 springs from here on out) were used on all overhead valve engines (read: Knuck and Pan) except FLH (the higher compression 74"). That reveals a bit of a discrepancy hidden in the specifications. Since the same valves, collars and keepers were used for both FL and FLH Panheads, it is safe to say that the -36 springs could safely be installed at the same height as the stronger FLH spring set, especially given the fact that there is no separate stem protrusion spec given for Panheads, FL versus FLH. But the "valve closed" spring height for the FLH spring is 1.375 rather than the 1.406 of the -36 spring. That would put the acceptable spring installed height of both spring sets somewhere between those two figures. Interestingly, if we give the 1.375 figure a +/- tolerance of .005" we come up with exactly the 1.370" to 1.380" recommended installed height for KPMI's "stock replacement" Knucklehead spring sets, which are claimed to be "manufactured to exact O.E.M specifications." Now it happens that I have measured enough Knuck valves, springs and collars over the years to confidently say that the spring installed height on a Knuckle will be .200" less than the valve stem protrusion measured from the tip to the top of the lip on the guide. That .200" figure is valid when using stock spring collars and valves with stock keeper groove location. It is also subject to the slight variation resulting from manufacturing tolerances. That means if we were to take the 1.370" spring installed height and add .200" to it, we could safely extrapolate (there's that word again) a 1.570" minimum valve stem protrusion. If we then want to take a stab at a maximum stem protrusion, I would suggest the same .045" spread that the Pans and Shovels use, resulting in a maximum spec of 1.615". But remember now, while that may provide a stock stem protrusion spec (depending on whether you buy into the multiple assumptions and extrapolations which I have made or not), this will only get you to the correct valve spring installed height. 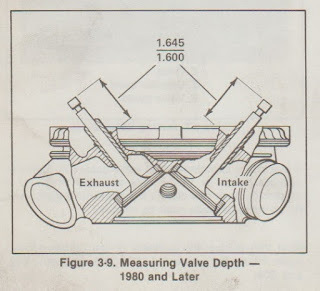 One still needs to take into account the discrepancy in thickness of the gaskets under the spring cups if you are really concerned with getting the valve to exactly the same relationship to the head and rocker arms as when it left the factory. Back here in the real world, though, the effects of the gasket thickness on rocker geometry are minimal. In fact, I would go back to what I presented in the previous stem protrusion post about how changes in valve lift affect theoretically correct rocker arm geometry. If you are running a stock lift cam, then you are done. As I mentioned, according to the Harley's service manuals, the lift of a Knuckle cam is .343". If anyone is wondering about this seemingly odd number, just convert that figure into a fraction and you will see it was quite obviously a rounding off of 11/32" - over the years Harley has been very comfortable with the use of fractions in their design parameters. Incidentally, if you notice that I have been playing fast and loose with the terms cam lift/valve lift here when writing about Knuckles, its because the 1:1 rocker ratio actually makes those figures interchangeable, unlike other OHV Big Twins. But if you simply read cam manufacturer's literature you might not realize that the stock lift was only .343". The Andrews "S" grind, which is advertised as a stock replacement for restorations is .355" lift. Lieneweber's mildest Knuck cam, the "0", is still a bolt-in but has .365" lift. Back when Sifton was Sifton, their only Knuck grind came in at a whopping .450" lift. Our friends in Viola seem to be the only manufacturer who makes a true stock replacement grind (even if it is listed as .346" lift). Using my "theoretically correct rocker geometry" method of adding 1/2 the increase in valve lift over stock to the minimum and maximum stem protrusion specs, one can see that even the mild bolt in cams add a little wiggle room. The 110 Sifton on the other hand, coming in at .106" more lift than stock adds a full .053" to the specs. In other words, if you accept my extrapolation (had to get that word in one more time) your stem protrusion specs would go from 1.570" minimum/1.615" maximum, all the way to 1.623" minimum/1.668" maximum. That would, of course, create other issues that would need to be addressed, such as spring pressure and installed height, not to mention top collar to rocker arm and cover clearances. But all of that will need to wait for another post. One last point. the figures I present here are my best estimate based on the numbers we do find in various factory service manuals. I will be happy to print a correction if someone can provide their source material for conflicting numbers, or provide reasoning that improves on my own. By no means do I mean any sort of insult to those who have presented different figures. It is entirely possible that the whole concept of minimum and maximum stem protrusion specs was not even on the factory's radar before the printing of the Panhead service manual, and was merely left to the common sense and/or whims of the re-builder. And in case anyone is not yet sure, the word of the day was, as you probably guessed, "extrapolation." Harleys are very rebuildable, and I would go so far as to venture that they may be among the most commonly rebuilt (using the term "rebuilt"somewhat loosely) of any engine family in existence. Such a supposition is somewhat bold, given the minuscule number of Harleys compared to the vast oceans of, say, small block Chevys. But face it, which engine is more likely to wind up in a scrap yard when it is in need of major repair? Given that, along with the often less than spectacular life span of a top end rebuild on Knuckles, Pans, Shovels and Sportsters, many if not most have seen multiple valve jobs over the decades. Naturally with each valve job performed, the valves will seat a little deeper in the head. The method of gauging how much deeper is via the valve stem protrusion specification. Valve stem protrusion is one of those specs that is sometimes overlooked and to some extent misunderstood when dealing with Harley heads. At issue are a several things. In no particular order; valve spring installed height, shrouding of the valve in the chamber, compression ratio, and finally rocker arm geometry. Having less than the minimum can lead to the devastating result of your valve springs reaching coil bind while your cam is still trying to lift the valves higher. Not a good situation and can usually be summed up as 'broken parts." On the opposite end of the spectrum is the Panhead that looks as though the pan covers have been bashed out with a ball peen hammer (because they have indeed been bashed out with a ball peen hammer) so that the valve spring collars would not hit them. Shrouding of the valve in the chamber from the valve being too deep is fairly easily remedied by a judicious modification of the chamber during the process of a valve job, though this too can overdone resulting in issues down the road when new seats are installed. Along with deep valve seats comes a reduction in compression ratio (aggravated via de-shrouding) by making the chamber larger. That may or may not be an issue depending on a number of factors. Valve train geometry is also at issue, but I will attempt to address that later in the post. To examine this subject I would like to start in the middle and work our way forward in time before going back to the beginning - that beginning being the Knucklehead. On page 75 of the Harley Davidson Panhead Service Manual - 1948-1957 Rigid, we find what seems to be first official mention of the specification (at least that I can find). The spec, which the drawing refers to as "Valve Seat Tolerance" is pretty self explanatory. It is the distance from the tip of the valve stem to top surface of the collar of the valve guide. The illustration also shows a gauge which was available for those lacking precise measuring tools or for quick checks. The gauge is simply a cylinder that straddles the guide. The "step" at the top of the gauge indicates minimum and maximum height; if the tip of the stem falls between the top and bottom of the notch, the stem protrusion is within spec. The 1978-1/2 to 1984 FL/FX 1200/1340 4 Speed Service Manual (note the title may not be growing in length but it certainly is in use of numbers) shows the same illustration (page 3-18) for 1979 and earlier, but it might be worth noting that it offers a different illustration and spec for 1980 and later. The difference, at least in part, is due to the changeover to valve guide seals. Earlier heads, both Pan and Shovel, only required a machined pad that was at least the diameter of the valve guide collar to locate the guide since the lower spring collar rested on the collar of the guide. The addition of seals made it necessary to rest the lower spring collar directly on the head to provide room for the seal, so the machined portion of the spring pocket was increased to the diameter of the lower spring collar. At first glance one might assume that the different spec is due to taking the measurement to a different surface, since it is now from the tip of the valve to the surface that the bottom of the guide collar seats against. And maybe that's the case, however, things don't seem to quite add up. If the collar on the guide is nominally .100" thick, then all is well. Add .100" to the early 1.500" to 1.545" spec and you come up with the '80 and later spec of 1.600 to 1.645". Ignoring the '80-'81 guides that used a .075" snap ring instead of having a guide with an integral collar, there is still the question of the gaskets that were under the guide collar on earlier motors. I had to look pretty close to even find the part number (18196-51) for this gasket in a Harley parts book since it does not appear in any later copies, though I have a small collection of them left over from top end kits. Measuring a random sample of these showed that they ranged in thickness from about .030" to .040". The James Gaskets catalog lists them as .031" thick with the application being 1951 to 1978. Hmmm,... so with a window of only .045" in minimum and maximum stem protrusion, we find a variance of at least .030" just in whether or not a gasket was installed under the guide when rebuilding. And what about '48 to '50 Pans and '79 Shovels? Won't they show up as nearly at maximum protrusion right from the factory? And what does that mean when considering '80 and up which certainly never used the gasket? Now the .100" difference in stem protrusion spec doesn't add up so neatly because you have an "effective" guide collar thickness of .130" (collar + gasket) for many years. Add all of this together and I think its safe to conclude that stem protrusion specification is probably not something will "make or break" your valve job unless you wander too far afield. My guess is that the spec was added after the fact as a guideline for mechanics rather than a part of the original design parameters of the Motor Company. And if all doesn't throw enough margin of error into the equation, then consider this. If the Motor Company's stem protrusion specs theoretically provide correct valve train geometry (and that is a gigantic stretch given shops such as Baisley High Performance have presumably made a fair chunk of money over the years from their service of correcting Harley rocker arm geometry), then that still means that when you increase valve lift via a performance cam, you have also changed the stem protrusion numbers which should theoretically retain correct geometry. Here is basically how it works. If you were to draw one imaginary line through your pushrod and another through the rocker arm's ball socket to the center of the rocker shaft, when your cam is at one half of its lift, the line should form a 90 degree angle. Likewise, an imaginary line from the center of the rocker shaft to the pad of the arm should also form a 90 degree angle with the centerline of the valve stem at that same half lift point. That way at zero lift the line through your rocker arm should be the same amount below 90 degrees as it is above 90 degrees at full lift. But that means that if you increase the lift of the valve with no other changes, then the angle with the valve closed will remain the same , but the 90 degree relationship between pushrod and rocker will no longer be at 1/2 lift. To get back to the theoretically correct valve train geometry you would need to lengthen the valve by an amount equal to 1/2 the increase in lift. Or, you could get the same effect by sinking the valve that amount. And guess which is easier and more cost effective, sinking the valve or having a custom valve manufactured? All of that is to say that with a performance cam, the theoretically correct stem protrusion increases at a rate of half the increase in valve lift. In practice this also has the added benefit on a Harley of providing the increased valve to valve clearance during overlap (commonly referred to as Top Dead Center lift) which is needed for those performance cams. Now, with all that to digest, I'll pause briefly before continuing with the question of valve stem protrusion on a Knucklehead. Stay tuned.